For the latest post in my occasional series about digital radio, I was intrigued to receive an e-mail from Classic FM this week advertising “HD audio” in their mobile app. There are versions of the app for Apple and Android devices, and they allow users to listen to live broadcasts, as well as to a library of on-demand programmes from the last week. I have never used the app, so was unaware of what bitrate it offered to start off with. I decided to examine it to discover what this “HD sound” actually is. When it first launches, with “HD off”, the app streams the low bitrate, 48kb/s AAC stream from the usual “musicradio” Icecast server. The details of those streams are unchanged since that article was written in 2012, except that the 48kb/s MP3 stream no longer exists. Most people wanting a low-bitrate stream are better off using the higher quality AAC anyway. Switching to HD requires logging in with a Classic FM account. However, rather than using the old 128kb/s MP3 stream, the app fetches a new, 192kb/s AAC stream at the URL /ClassicFMHD. Unfortunately, this stream can not simply be used from within a PC’s media player or internet radio. It requires some sort of authentication so that only the official mobile app can make use of it. This follows the trend set by the BBC, where – officially at least – only website or mobile app users can receive the highest quality broadcasts for listening through their cheap ear buds, whereas people with high-end hi-fi equipment are supposed to be satisfied with 128kb/s DAB broadcasts. As with the BBC’s streams, it is possible to reverse engineer the Classic FM app and find a way to access the streams, although it isn’t straightforward to listen that way as it involves generating a URL that’s only valid for a short period. Given that it required reverse engineering, I am not going to publish details here, but anyone who is interested is welcome to contact me for more information. As an aside, I should mention that I sometimes found when restarting the app that it streamed in HD mode from startup even though it said “HD off”. It required a toggle on and off to stream at a lower bitrate, a bug that could quickly eat up mobile users’ data allowances. Is it actually worth the trouble of using the HD stream outside of the app? 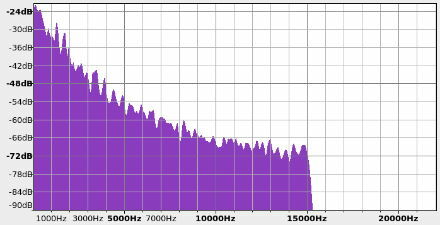 A look at the frequency spectrum of a typical broadcast (the end of Alfred Hill’s piano concerto – I hadn’t heard of him either!) immediately shows one disappointment. The frequency cut-off is still 15kHz. With 192kb/s AAC to play with, I would have thought that could be extended to 18kHz at least. This is probably more to do with the processing chain at Classic FM than a deliberate attempt to restrict the quality, but it’s as if they want to retain some features of FM broadcasts even when most people are no longer listening to analogue radio! There are some subtle differences in the spectrum compared to the 128kb/s MP3 stream, but nothing compared to the difference between those and the low-bitrate AAC stream, which has plenty of holes and a much rougher appearance. That is only to be expected. To the ear, I do think the HD stream has the edge, with a slightly richer bass and more detail at high frequencies, although annoyingly it shows up the dynamic range compression of the advertisements far more. I hope they will further improve the stream in the future by adjusting the 15kHz low-pass filter. In the meantime, I’d reassure Classic FM listeners around the world that the MP3 stream is still one of the best ways to listen. Internet streaming is the clear winner when it comes to sound quality. I recently built a TV Headend server with a satellite card in it, and when playing the stream with VLC, then VLC says the stream is 192kb/s at 48kHz. I see the same 192kb/s @ 48kHz for BBC R4 FM on satellite. I hadn’t looked into satellite bitrates. I believe they use the MP2 codec, so are better than DAB radio for sure. Officially, you can only stream the 192kb/s AAC Classic FM stream using their app. Getting it to play in VLC or any other software requires some hacking! 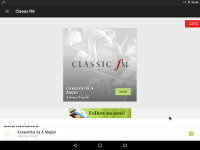 Iould be great full if you could email with details of how to listen to the Classic FM 192 stream without using the app.